The day of the Whit Friday Band Contest started with an extremely heavy downpour of rain. May was a pretty cold month and there had been hail at times but this rain was the type that bounces and wets you a second time; you got one soaking as the rain came down and another as the rain bounced back up. There had been a call out for volunteers to help with the band contest this year with marshalling so I went to Mossley to help. I had seen Stalybridge Old Band play in the pouring rain once to the point I thought the tuba player may drown so I knew the bands were a hardy bunch. I arrived around 3pm and thankfully the rain had stopped. I looked around the market ground and spotted a burger van. This was a good sign and probably meant am event was happening here but there was no one else about. I could hear a brass band rehearsing down the road but then it started raining so I hid in the car. The rain stopped and the sun beamed through the car instead and suddenly I was absolutely red hot in my waterproof coat. I leapt out of the car to cool down and found a man in a high visibility jacket who just happened to be the organiser. Paul and his family were running the event and were volunteering to help sign the bands in, marshal the roads and the route and help with the coaches that were arriving with the bands. There were now two caravans. One with the adjudicator sat in listening to the bands play their set pieces which was based in St Joseph’s School yard (the adjudicator isn’t able to see the bands so he is judging on sound alone). 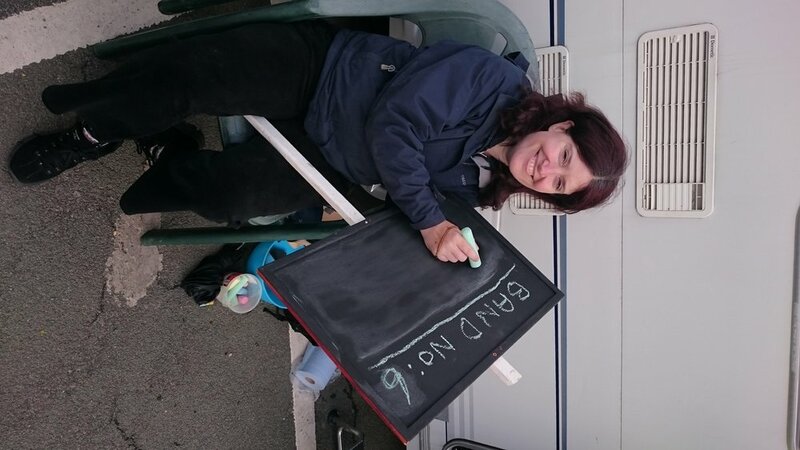 The other caravan was around 100 yards away on the market ground for the bands to sign in when they arrived. I was sat outside the first caravan with another volunteer called Terry. Terry would find out who the band was and what they were playing and I would note it down on a chalk board which was then given to another volunteer David. David had a very important job of standing in front of the band and marching with them to the school yard carrying the sign I had written so the audience watching could know who the band were and what they were going to play. I was a bit worried about my spelling on the sign so much so that when the first band arrived I panicked and thought I couldn’t even spell Mossley; which was unfortunate because Mossley was the first band to turn up. I think I managed pretty well with my sign despite a lack of confidence at the beginning until I found out that The Australasian was one of the set pieces and the final straw was two bands choosing to play Mephistopheles. Terry called to me across the market ground “just write Mephi”. I thought I would write it out in full for probably the first time in the band contests history but by the second time I opted for simply ‘Mephi’ as advised. I had a prime place to watch the bands set off and they were brilliant especially Macclesfield Youth playing the theme to Game of Thrones to a slow march and they went on to win the overall youth contest. Paul, his family and the rest of the volunteers were very friendly, making teas, chatting and laughing together. From the moment the caravans arrived, the rain stopped and the sun shone. It was a beautiful evening in Mossley but it was very cold. I was wearing two coats. One band came and said they were “Brass Monkeys”, we said we were too and “wasn’t it cold for this time of year” until we realised that they were just telling us their name “Dobcross Brass Monkeys”. I have already volunteered for over 10 years and in this year I have been with over 40 groups and organisations so far who rely on volunteers but it was only in this moment that I realised just how many events wouldn’t run if it wasn’t for volunteers. People willing to write on boards and match with signs, never mind all the other jobs that need doing that you just don’t realise as a spectator to these events. Paul and his family not only organise the day but volunteers raise the prize money and enough to put the event on such as hiring the port-a-loos. I wished I could have stayed for the complete night but after some chips and a warm in the caravan I set off home after 25 bands had played having had an amazing evening.